The Train of Thought: How About A Free Trade Agreement? The Obama administration has announced that it intends to finalize a new free trade agreement with South Korea (KORUS FTA) in time for the next G-20 summit in November. Although the U.S. International Trade Commission (USITC) projects this will have a small positive impact on the U.S. trade balance, and “minimal or negligible “ impact on U.S. employment, history shows that such trade deals lead to rapidly growing trade deficits and job loss in the United States. The Charts below compare USITC’s estimates of the impact of the forthcoming free trade agreement with Korea to EPI’s own calculation. 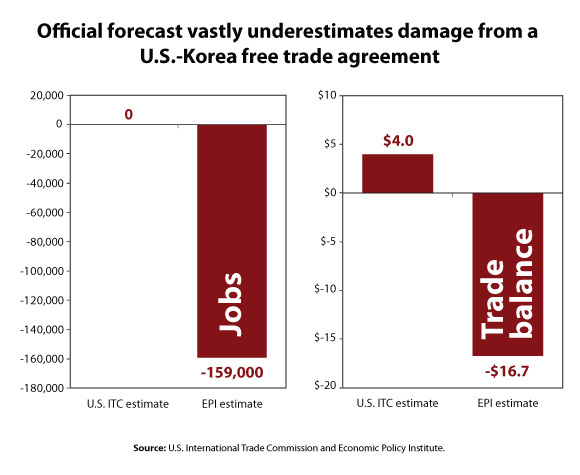 Unlike USITC’s forecast of a small positive impact, EPI’s research shows it will increase the U.S. trade deficit with Korea by about $16.7 billion, and displace about 159,000 American jobs within the first seven years after it takes effect. In fairness, other than a few weak worded and uncomfortable statements about trade in Ohio during the primary, it was always clear that Obama was fine with continuing our failed NAFTA model trade agreements. The Korea free trade agreement (FTA) did not have to instigate what will now be a nasty political battle. It could have provided the perfect platform to implement President Barack Obama’s promised trade policy reforms to remove the worst job-killing aspects of former President George W. Bush’s North American Free Trade Agreement (NAFTA)-style deal and rebuild bipartisan support for trade expansion. Within weeks of Obama’s June announcement about moving forward with the Korea deal, 110 members of the U.S. House of Representatives sent a letter to Obama warning that they would oppose the pact in its current form – noting that moving forward with “another job-killing FTA” was “unthinkable” in the current economic climate. They laid out essential reforms needed to the pact’s labor rights, foreign investor offshoring promotion and financial deregulation terms needed for them to support the deal. Labor unions and consumer and environmental groups also quickly reiterated their calls for the administration to fix the Bush Korea text by removing the worst NAFTA-style terms so that it could become the first in a new era of widely supported trade deals. In September, Obama received a letter signed by more than 550 faith, family farm, environmental, labor, manufacturing, consumer protection and civil society organizations calling for the same core reforms and noting that they could not support the deal in its current form. The current text includes the extraordinary investor rights that promote offshoring and expose domestic financial, environmental and health laws to attack in foreign tribunals. Signed before the financial crisis, the pact calls for financial services deregulation that is at odds with the lessons we’ve learned from the economic crisis and that may conflict with recent reforms made by both the U.S. and Korea. The pact also explicitly forbids reference to the International Labor Organization’s conventions that establish internationally recognized core labor standards. Unfortunately the fix that related to cars caused the UAW to betray their union brothers and sisters by supporting the agreement. This is a bad idea for a lot of reasons (detailed here by Marcy Wheeler), but it's unfortuate because it gives the dreaded "liberal cover" for spineless politicians to hide behind. The silence from others in the Labor movement is deafening. They must come out in opposition to this deal now, and show that you can't just pass another extremely unpopular "free trade" deal without a fight.